Now I know why this is the first time (and perhaps the last time) that I show you a project before it’s finished. 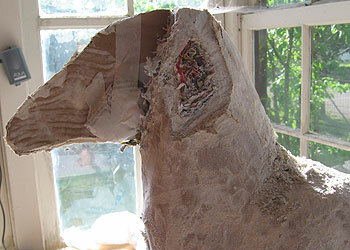 Here it is Day 10 already, and my paper mache horse isn’t done. But I am happy to say there are a lot of lessons learned with this project, and I’ll be able to use the things I’m learning to make my next sculptures easier. One thing I’ve learned is to never say I’ll have something done “tomorrow.” My daughter, Jessie Good, is really good at posting her “one-a-day” oil paintings on her blog almost every day, and she seems to learn something new with every painting. Experts on how people develop their talent say that Jessie is doing it exactly right – by practicing something every day, she accelerates the learning process and automates many of the techniques she learns along the way. Another thing I learned is that it really is worthwhile to make a full-sized pattern before you begin – but it only helps if you keep referring back to it as you work. I didn’t do that – but I was able to see my errors when I finally did go back to the pattern to see where I went wrong. I intend to use patterns a lot in my projects from now on. Since I didn’t pay attention to my pattern this time I added too much material to the head, putting in bumps and bulges that didn’t belong. I tried to work around this problem by adding more material to other spots, but that made the head way too big. I knew I needed to take everything off the head, right down to the original cardboard pattern, and start over. Fortunately, errors can be fixed when you’re doing a paper mache sculpture.Â All you really need to do is get out a small saw and remove whatever you don’t like about your sculpture, and then start again. Hi, really impressive. I would like more info on any books, you might have available.Never tried my hand in this superb craft, and i would really like to give it a go.Saw some of your videos,and the word is “simply fantastic”even the way you show all your trade “secrets”.So please, send me some info,on what literature you have.I find it more easy to follow on a book,i do a lot of bedtime reading, and this,i think would keep me up all night!What i am really interested in is patterns, and how to keep the lines of the original pattern, as you go along, building the model.Thanks again, hoping to hear from you soon. What an ambitious project! It takes guts to let the world see your work-in-progress. 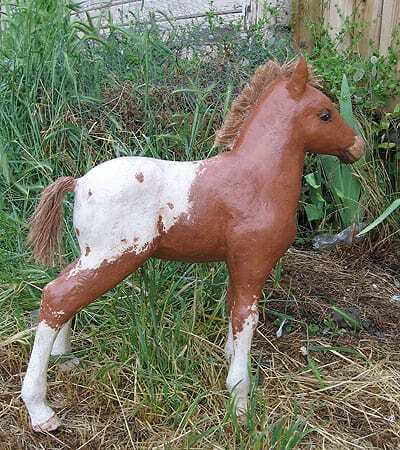 I think just because paper mache is a relatively inexpensive media, it gets the undeserved reputaion of being easy–it may be cheap, but it ain’t easy, especially when you take on something this difficult! I think most people really don’t have any idea how time-consuming it is, either. Hi Lori. I got the idea of letting people see my project as I went along when I saw Mario showing people his Tin Tin bust, which he made using the instructions on this site. I decided that if he could do it, so could I. However, I do admit that the other tutorials on this site are a lot less embarrasing, since I tend to tell people only what worked and leave out all the bits that I had to do over. So now everyone knows that I don’t actually know what I’m doing before I start a sculpture. However, it’s my strong belief that if I don’t make any mistakes or have any problems during a project it means I’m not testing myself enough – and I haven’t learned anything, or improved my craft. And what’s the point in that?